Kyle Lowry scored 26 points, Luis Scola had 15 points and 10 rebounds and the Houston Rockets beat the Toronto Raptors 88-85 on Tuesday night. The Houston Rockets are winning the close ones with a rugged schedule ahead. Kyle Lowry scored 26 points, Luis Scola had 15 points and 10 rebounds and the Rockets beat the Toronto Raptors 88-85 on Tuesday night. Houston has won four in a row, and five of its last six to move seven games over .500 for the first time this season. The Rockets have had to sweat out the last three wins, coming through with clutch baskets and key defensive stops at the end to hang on. "We've built on it so much, and our team has come together so well," Lowry said. "We have the faith in each other to make the plays, make the right plays and right decisions for each other and win games." Kevin Martin scored 14 points, though he missed a free throw with 11.7 seconds left that gave the Raptors a chance to tie it. But Linas Kleiza missed a long 3-point try, Martin corralled the rebound and the Rockets won for the 18th time in the last 25 games. "The last possession was huge," said rookie Chandler Parsons, who came up with a key offensive rebound that led to Martin's late free throws. "We all switched, we all communicated, and we made them take a tough shot." The Rockets finished a 5-1 homestand and now face another demanding stretch, with games against Denver and the Los Angeles Clippers this weekend before a weeklong road trip. "We're not going to make the playoffs just by winning home games," Scola said. "We need to win on the road, we need to win big games." DeMar DeRozan scored 17 points, James Johnson had 16 and Ed Davis tied a career-high with 15 rebounds for the Raptors. 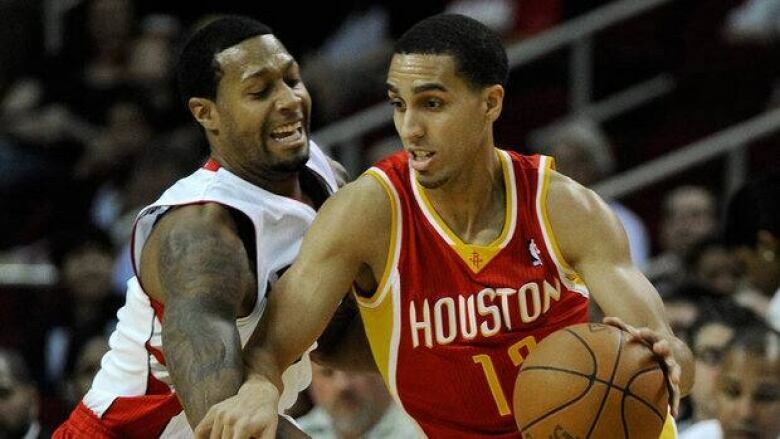 Toronto outrebounded Houston 47-37, but went 2 for 17 from 3-point range and committed 17 turnovers. The Raptors have lost eight of their last 10 games. "I liked our effort and we competed as a team," Toronto coach Dwane Casey said. "Basketball plays and basketball decisions have to get better." The Rockets have won 25 consecutive games when holding their opponent below 90 points, and they're 13-0 in those games this year. Scola scored eight points in the first seven minutes, and Houston took advantage of Toronto's poor shooting to build an early lead. The Raptors started 2 for 11. The Rockets, meanwhile, played efficiently at the start, opening 10 for 21 from the field to lead 27-15. Houston led 45-36 at the break, despite getting out rebounded 27-19. The Raptors hurt themselves will 11 first-half turnovers. The Raptors continued to control the boards in the third quarter, and trimmed the deficit to three on DeRozan's dunk with 1:53 left. Goran Dragic beat the clock with a driving one-hander to put the Rockets up 69-64 heading to the fourth. Lowry swished a 3 with just under five minutes left for an 81-73 Houston lead. The Raptors answered with a quick 6-0 run, capped by Amir Johnson's layup. "We got the game under control," Scola said, "and then we started making a lot of mistakes. They even got back in the game, and we were lucky." Toronto trailed only 85-83 when Parsons grabbed an offensive rebound off a Martin miss. Martin got Anthony Carter in the air on a head fake and drew the shooting foul with 11.7 seconds left. "We believe in ourselves and we were right there at the end, but we couldn't get it done," Raptors guard Jose Calderon said. "We have to try and learn to win possessions at the end of the game." Martin, an 88.6 per cent free-throw shooter, made the first try, but missed the second, and Houston led only 86-83. The Rockets guarded Toronto's inbound play well, Kleiza was forced to take a 30-foot 3-pointer from a bad angle, and Martin rebounded.